Top » Catalog » Replacement Parts » 03-6035-4 Bookmark Us! Transparent Pop Bumper Skirts (6 Hole) suitable for Williams, Bally, Data East, Sega, and Stern Pinball machines. Use the Clear Skirts to show hidden art that can be hidden on many games due to the opaque nature of the standard skirt. These skirts are made of a transparent polycarbonate material which can allow any art of the Playfield to show through to the player. 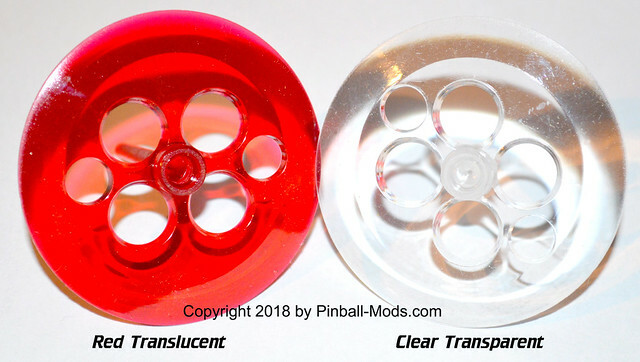 Combine them with our Clear Pop Bumper Bodies for a awesome and unique effect. Use the Red skirts to match our Red translucent Pop Bumper bodies. Additionally; Please note that these skirts do not have "points" which is consistent for most modern pinball machines. If your game requires points to function properly; please use a standard opaque skirt with points available at other retailers. Notify me when "Pop Bumper Skirt" is re-stocked.